US consumers making purchases at 300,000 self-serve machines across the country will soon receive exclusive offers, promotions and discounts toward future purchases when using Apple Pay to complete a payment. 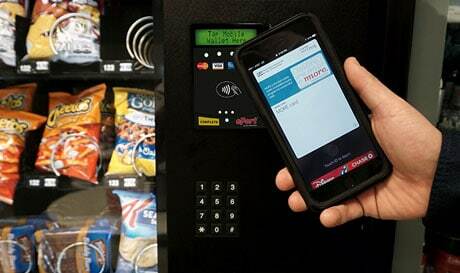 The service is brought by cashless vending machine technology provider USA Technologies (USAT) through an integration of its More loyalty service in self-serve machines connected to its ePort Connect platform. “Following the integration, unattended operators will be able to offer an enhanced experience to their customers using Apple Pay,” USAT says. “Consumers paying with Apple Pay at participating ePort merchant locations would simply hold their iPhone or Apple Watch to the contactless reader to pay, earn and redeem loyalty points with a single motion if they are already participating in USAT’s More program. “We expect the More integration with Apple Pay will not only fuel participation in the unattended loyalty program, but also underscore the ease, security and simplicity of Apple Pay transactions,” says USAT’s Maeve McKenna Duska. The company plans to roll out the technology to select unattended retail locations nationwide “over the coming months” and demonstrated how the service will work at The Digital Money Forum at CES 2017 in Las Vegas this week. A white paper available to download from NFC World’s Knowledge Centre reveals the results of a six-month study by USAT that tested targeted point-of-sale advertising of Apple Pay at unattended vending machines. It found such targeted, interactive digital advertising combined with a call to action increased total sales, encouraged customers to use their iPhone to make payments and that, when asked to pay with their phones, customers were more likely to make additional purchases.